Like a dandelion reaching up to the sky on a warm spring day, the James Webb Telescope peers upwards in this stunning new photo released today by NASA. Still under construction, the powerful space-bound telescope will soon be shipped across the country for the next phase of its development. In this photo (above), NASA technicians can be seen lifting the fully deployed primary mirror with a crane. The telescope’s 18-segmented dish is being moved—ever so carefully—to a clean room at NASA’s Goddard Space Flight Center in Greenbelt, Maryland. With the construction phase mostly complete, NASA will now prepare the telescope for transportation to the Johnson Space Center in Houston, Texas, where it will undergo further testing. 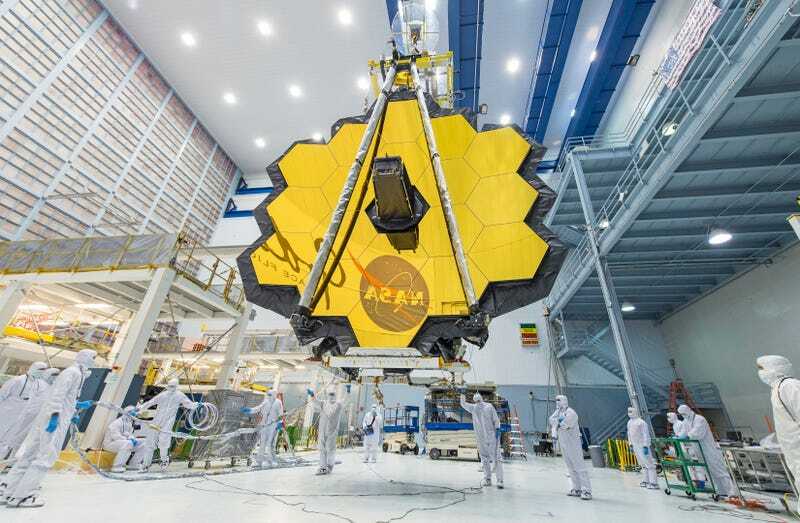 The James Webb Telescope is the successor to the Hubble Space Telescope, and it’s poised to become the most powerful telescope ever placed in Earth’s orbit. Once in space, it’ll capture light from some of the dimmest and oldest galaxies in the universe, and gaze inside cloudy nebulas where stars and planetary systems are formed. It’ll even be able to detect subtle differences in the atmospheric composition of exoplanets, jumpstarting the hunt for signs of life in the air of these distant worlds. The new image is not the first to show the telescope in its unfurled position, but it’s probably the best glimpse yet of this magnificent piece of engineering. In preparation for its launch, the structure will be folded up and packed tightly inside an Ariane 5 rocket. Once in orbit, it’ll go through a series of deployment procedures. The James Webb is currently scheduled to launch from French Guiana in October 2018. Over the past several months, the James Webb has been undergoing acoustic and vibrational testing to ensure the structure and its instruments will be capable of withstanding the rigors of launch. In tests, the telescope was exposed to simulated shaking forces that caused it to vibrate from five to 100 times per second. Once the telescope arrives at the Johnson Space Center, NASA technicians will test its many onboard instruments, including the 6.5-meter-wide primary mirror and its 18 hexagonal segments, the near InfraRed Camera (NIRCam), Near InfraRed Spectrograph (NIRSpec), and Mid-InfraRed Instrument (MIRI). Given the many years of planning and construction, along with its $8 billion-plus price tag, it’s poised to be one of the most nerve wracking launches in recent memory. But once in space, this remarkable telescope could revolutionize what we know about the cosmos and our place in it. Why the Hell Does the James Webb Space Telescope Look Haunted?